Introduction: After a successful trout trip to Tahoe our appetite for catching big trout only became more voracious, and we decided to venture into Nevada to visit Pyramid Lake where we hoped to hook into some of the lake�s stunning Lahontan Cutthroat trout. 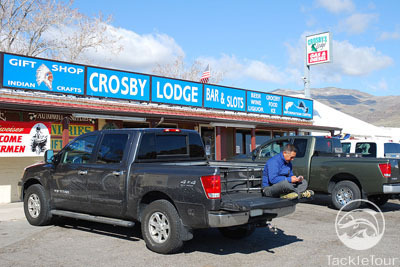 I have wanted to visit and fish Pyramid Lake for years, but have never managed to make the trek over the mountains into Nevada from the Bay Area, and instead have focused on Crowley for the majority of my trout fishing. Mark Knoch offered to show us some of his spots as well as his proven techniques and we jumped at the opportunity to learn more about this renowned fishery. 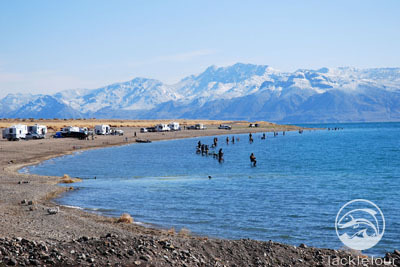 Pyramid Lake is well known for the Lahontan Cutthroat Trout that inhabit the lake, and the record size cutthroat trout was caught at Pyramid Lake and weighed a whopping 41 pounds (18.6 kg). About Pyramid Lake: Pyramid Lake is quite unlike any body of water that I have ever fished, and is a considerable contrast to Lake Tahoe which is a mountain lake lined with a combination of trees and resorts. When you drive into the Paiute Indian Reservation where the entire lake resides within you notice how dry the surrounding desert is, in fact it looks straight out of an old western until you get a glimpse of Pyramid. This bright blue jewel of a lake pops out of the desert and in stark contrast to the brown and grey surrounding deserts and mountains the lake sparkles brightly with the shallow water looking turquoise, and the deeper portions of the lake appearing more indigo in color. There are no buildings that can be seen on the edges of the lake until you drive further in to Sutcliffe, and for the most part the lake looks almost out of place nestled under the mountains. The further you drive into the reservation the better view you get of the entire lake, and only then do you come to appreciate just how massive a body of water Pyramid really is (188 sq. miles of surface area). Pyramid Lake is the largest remnant of ancient Lake Lahontan which once covered much of northwestern Nevada at the end of the last ice age. 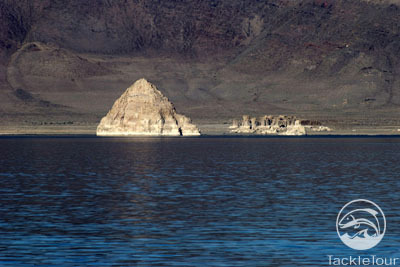 The lake as we know it today was once the deepest point in Lake Lahontan. 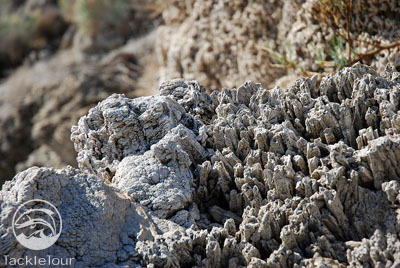 The modern name of the lake comes from the notable tufa rock formations that grace the lake. The largest such formation, Anaho Island, is sacred land and also home to a large colony of American White Pelicans, and is highly restricted for both spiritual and ecological reasons.